Summer time means grilling time. And I have been doing a lot of it lately. One of the perks of living in a condo is that you reap all of the benefits of grilling without all the hassle: The gas tank on the grill is always full. The grill is so big I could cook a whole pig on it if I wanted to (I don't, but it's nice to know that I could). And best of all, the grill smell doesn't get trapped inside the house (cause let's face it, that steak you enjoyed for 7:00 o'clock dinner last night doesn't smell so great at 6:00 am the next morning). Neither does extra strength Febreeze. So this past Sunday after returning from the farmers' market with bags full of red bell peppers, zucchini, and eggplant, I knew I had to make some marinated grilled vegetables. A good portion of them went into this Farro and Grilled Vegetable Salad, the fourth salad of my Super Satisfying Salads Series. What is farro? Farro is the mother of all grains. Really. This deliciously nutty, chewy whole grain was used by the Egyptians over 6,000 years ago. Yet, it's only relatively recently that it's become vogue. 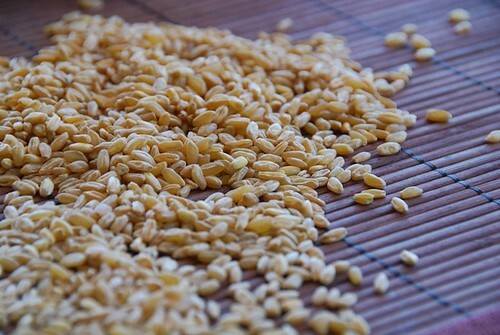 Farro or emmer is most closely associated with Italian cuisine and has been enjoyed there since ancient Roman times. Unfortunately, because farro is rather difficult to grow, it eventually became replaced by durum wheat. Over the last few years, thanks primarily to European chefs and gastronomes, farro has staged a comeback and is rightfully reclaiming its place at the dinner table. I for one couldn't be more pleased. Farro is a satisfyingly chewy grain that is high in fiber and protein, which helps keep you full long after you've finished eating it. Plus, farro is remarkably versatile: use it in salads, as a stuffing, as a breakfast cereal, or in place of rice or pasta. Where can you buy farro? 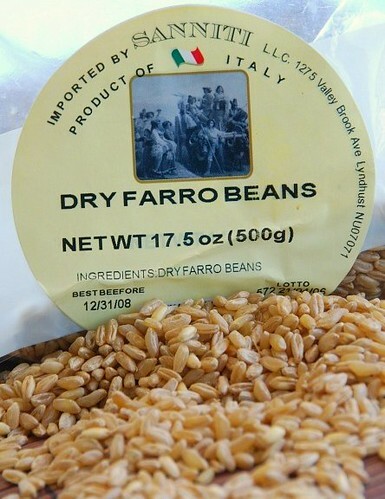 Some organic markets carry it, though the best place to find farro is at an Italian market or deli. Farro is pricey. A 15-20 oz bag typically ranges from $6-10, but trust me when I say it's worth it. 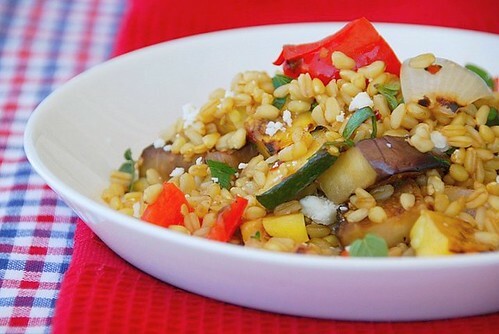 If you can't find farro, then spelt or barley make good substitutes. They don't have exactly the same firm texture and nutty flavor, but they are tasty and cook more quickly. Soak farro in cold water for 30 minutes. Meanwhile, in a large Ziploc bag or tupperware container, add ingredients for marinade and shake well. Add vegetables, and shake until well coated. Marinate for 30-45 minutes. To make the dressing, simply whisk all ingredients (except herbs) in a small bowl and set aside. Add herbs just before finishing the salad so they stay green and fresh. Drain the farro. Place in a small pot and cover with 3-4 inches of water. Bring to a boil and cook uncovered at a rolling boil for 20 minutes, or until tender. Cooked farro should be firm and chewy but not hard. Drain and place in a large bowl. Drain marinated vegetables. Place on a hot grill that has been lightly oiled. Grill vegetables for 5-7 minutes per side on medium-high heat, or until tender and lightly charred. Chop vegetables into 1-inch pieces. Add to the bowl with the cooked farro, then add dressing and fresh herbs and toss until well coated. Sprinkle with feta cheese, if desired. This is a great recipe and I appreciate your introducing it to a wider audience. Farro really is an excellent ingredient and you have done a nice job here with this very timely summer preparation. Grilling and roasting veggies are my favorite methods of cooking. It releases so much flavor. I could make a whole meal just out of the grilled veggies. The salad looks great! Farro is awesome. I can't eat it anymore but I use to love it. Your salad looks so good. I love all the grilled vegetables... yummy. Mmm this looks perfect. I have been wanting to try farro for a while. As a person whose heart belongs to quinoa and barley, I know I would love it. I think I would love it too much and at $8 a bag (at my nearest organic store), I'm worried I would spend $24 a month in farro. But maybe I will, anyway. :) Now, please tell me why you have not grilled a whole pig? I think quinoa would be delicious with these veggies, too, though it doesn't have the same chewy quality as farro. My dad grilled all the time when we were kids, but only meat -- grilling vegetables was a revelation the first time I tried it! 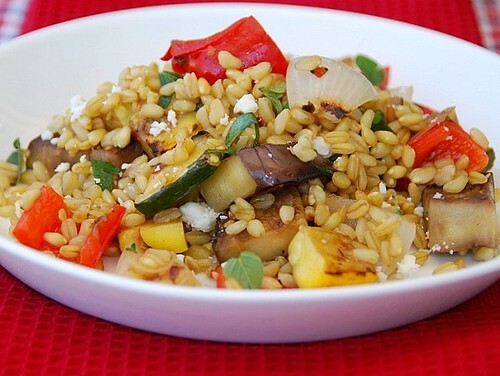 I have been looking for ways to use farro, and this salad sounds great. I am always exploring with different grains. The vegetables on the grill look gorgeous! This looks like a fantastic salad. I do love farro. I haven't found it yet in Utah and I've nearly finished off the bag Rand sent me, so I think I need to find a place to buy it online! How interesting! I'd never even heard of farro. Looks great - I'll have to keep my eyes open in specialty food markets and give it a try. I love Farro! That tasty cereal is very versatile and useful! Your grilled veggie salad looks delicious! I've never seen farro before. Looks a lot like wheat berries. Your picture looks so good, I have to believe you when you say its good. Ok Susan...I have been sitting on a bag of farro and a few more Fall style recipes but now you've blown the lid off that.....I must make this salad! All those veggies on the grill....well, I would eat those plain but pair them with farro and I couldn't be more eager to give it a shot. I also love wheat berries, which can be a good sub for farro as well. We mix them 50/50 with rice. I've never tried farro before. You photographs are always lovely. 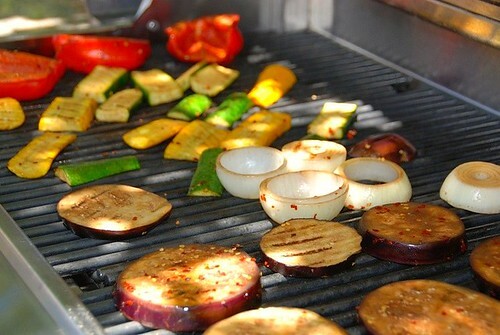 The vegetables laid out on the grill look especially appetizing. Never heard of farro Susan, though these look remarkably like wheat grains. I love the marinade & the mix of veggies. Very colourful & pretty! sounds (and looks) delic! And I appreciate the info on farro as I have had it in a few things recently and really liked it but had wondered why I had not heard of it before. I love farro for precisely the reason you have posted it - SO satisfying. There is something about putting veggies in it too that makes you feel so summery and virtuous, perfect. I would love this for lunch. Every time I come here there's always something new to learn. Good post as usual, Susan! Okay - I hear you...this sounds good and I'm loving the dressing! Lovely salad (my OH would particularly like this - he asks for chilli in everything). I'm jealous that you can get farro reasonably easily and at not too steep a price. It's still not that easy to get in the UK, though spelt seems to be cropping up more and more. Is there a litte touch of feta on there too (the white bits)? Never heard of farro before but it does resemble like wheat grains. I love your bbq and your salad looks delicious. after seeing this salad I really need to buy a grill. This looks delicious! I've had no luck finding farro locally, so I think I'm just going to have to mail order it. I can't wait to give it a try. I've never heard of farro here in Asia before, but they sure look hearty to eat. I love grilled vegetables, they are just so tasty even on it's own. Haven't seen the grain here but have definitely seen the flour, ditto spelt. A friend was given a cake the other day made from spelt flour by a well-meaning colleague who knoew she was gluten-free. Sadly, spelt/farro is not gluten-free (one would think the giveaway might be in the description as an ancient form of wheat... but there you go! The salad looks amazing - I adore grilled veg. Mmm this salad looks just perfect!! I've been trying to find farro for a while but haven't come across it. Thanks for the tip to look at an Italian store! Wish we had grills like that here. So much space... Never tried farro before so thanks for the interesting tips! marc-Thanks, I'm glad you like it. alexa-Sorry you can't have it anymore. Perhaps you could sub quinoa? lydia-I experience the same thing with grilled veggies. manggy-You can never go wrong with simple and delicious. rita-I hope you enjoy it! kalyn-It's not that easy to find. I got mine at a local Italian deli/market. giff-I hope you try it. aparna-It does, but it has a slightly different flavor. kate-I love wheatberries too. Hope you enjoy the salad, and i'll look forward to your fall recipes. eve-It's slowly but surely becoming known. 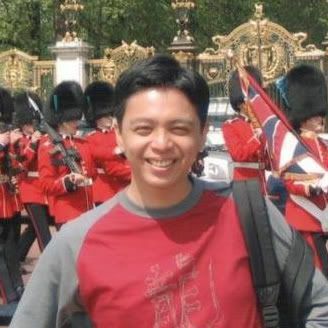 arfi-Well, I'm so happy to hear that. sophie-Yes, I forgot to add it to the recipe! Thank you. ivy-I've never heard of wheat grains! susanv-It's kind of hard to find.